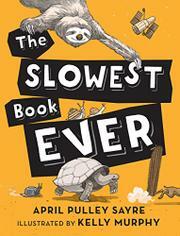 Sayre beckons kids to investigate and ruminate on slow-moving animals, slow-growing plants, slow motion, and plenty more. In loosely arranged sections, the author adopts a conversational style to both inform and amuse curious students. She covers expected topics, such as the centuries-old sequoia tree, the land snail, and slow-forming geologic wonders like the Grand Canyon. But refreshing, often fleeting twists of topic, delivered with repeated exhortations for kids to slow down, ponder, and study, combine for a galloping volume that respects children as capable scientific thinkers. Sayre examines time’s effect on natural materials, from the Statue of Liberty’s copper to the erosion of gravestones. The origins of the air and water that compose human bodies get a look, as does the biology of intentionally slow practices such as tai chi and yoga. The concept of “slow” in art and culture—evidenced in the slow-food movement, the art of bonsai, and John Cage’s composition “As Slow as Possible” (which will last about 639 years)—is playfully introduced. Current scientists and their work are interwoven. Murphy’s cartoonish illustrations provide more humor than elucidation. The whole shebang winds up in outer space, where Sayre introduces concepts like light-years and dark matter and calls on kids to think “big, slow, chewy thoughts” about the expanding universe.